Hillary Clinton’s “Pay to Play” corrupted strategy has now been documented in the embodiment of a 2015 e-mail she sent to Israeli multibillionaire Haim Saban, wherein she asks him brazenly for instructions on how to proceed with sabotaging the only peaceful and effective means to force Israel to once for all end its brazen international law violations since most particularly 1967, when it invaded, occupied, and later started to annex the 25% of Palestine which was left after the violent 1948 British empire facilitated takeover of 75% of Palestine, when close to one million of the autochthonous Palestinian of the land they owned and lived in for centuries, was literally stolen from them during as a result of massive influx of Zionists from Europe and North America. BDS stands for Boycott, Divestiture, and Sanctions. It calls for a peaceful solution with justice for Palestinians and security for the Jews who have settled illegally in particularly the 1967 West Bank, Gaza, Golan Heights, and East Jerusalem. In reality the “state” of Israel is devoid of fundamental historical and legal legitimacy as it is the product of the morphing of a religious faith by ethnocentric nationalists into a state which was implanted in the midst of Palestine with the message given to its legal inhabitants that they must “abide, leave, or die”. Today this so-called state entity is in a real state of a major crisis as it is in effect now has become the only Apartheid state in the world so that a majority is about to be ruled by a minority while said majority does not have democratic rights and is under ruthless military rule, has been the object of egregious human right violations, collective punishments, massacres such as most notoriously the one in Gaza during the Summer of 2014 when close to 3 thousand mostly innocent, unarmed civilians, including 500 children, were massacred by the order of the Netanyahu et al, Likud government. So, here comes Hillary Clinton, while continuously suggesting Donald Trump of being a racist, (which he well may be) supporting an Apartheid state which was created on the basis inapplicable basis of the Bible which in Deuteronomy Chapter 10, lines 10-12 gives God’s “chosen people” the right to take over the land of others. The bible is not a lien for the real estate rights of those who have resided for centuries in Palestine. This hypocrisy is beyond words when this politician yields to extreme right-wing racists who deem themselves to be superior to what the American Defense Initiative characterized the “savages” (i.e. the Palestinians) in huge signs it got away with posting on Washington, DC and New York City collective transit vehicles with the caption that “In Any War Between the Civilized and the Savages, You Must Support the Civilized, You Must Support Israel“. This monumental Kafkaesque dulteration of world history is repulsive to the extreme. BDS is strongly supported by rational, peace aspiring, humanist Jews in the U.S. by such organizations as Jewish Voice for Peace, The National Council for Judaism, and others, and in Israel by the Peace Now movement and others, as well as by millions of assimilated Jews all over the world and includes some 25,000 Jews in Teheran, Iran who are happily assimilated there and even own their own vineyards. 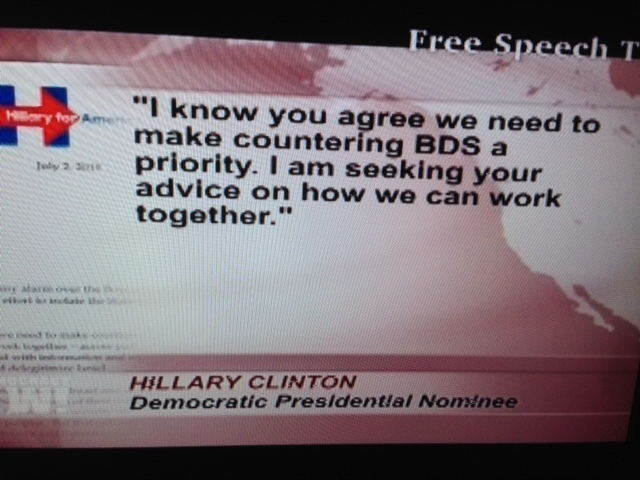 The true character of Hillary Clinton is exposed when she greedily and without the most fundamental principles stoops sycophantically , to billionaires such as Haim Saban, Sheldon Adelson, the Las Vegas casino mogul, and others who have contributed to her foundation, and asks Saban for instructions on how to destroy the peaceful path for a just solution for the Palestinians and decent Jews in Palestine, which will not involve violence against Jews. To add insult to injury, just as Hillary Clinton had the shamelessness to declare the former 30-year long oppressive ,murderous dictator of Egypt someone she regards like a “friend of the family“, she also declared at an annual AIPAC meeting in Washington, DC that the first thing she will do when inaugurated is to invite the despicable PM Netanyahu to the White House (the same man who disgustingly invited himself to Washington and into the Congress building with the collusion of the 47 Tea Party right-wing Republicans to attempt to derail President Obama’s “P5+1” successful diplomacy with Iran on the nuclear issue). “We the people” do not deserve to have to choose between such inferior and mediocre and possibly dangerous to our stability and national security candidates as Donald Trump or Hillary Clinton for our next president. The ONLY choice for competent, high integrity, leadership which will render us an inspiration to the world again, as well as will embark the United States into a path of regained resourcefulness and splendor by a reformed refocusing of our priorities away from foreign entanglements and undue influence hegemonic special interests, is the third-party alternative of Doctor Jill Stein, Ajamu Baraka, who could be joined by the founder of the progressive movement which is now irreversible. The politics of fear and the unethical lack of coverage by the corporatist/militarist mainstream media and establishment of this viable and sustainable imperative of an alternative must not be allowed to intimidate us or distract us from reaching the healing and united solution of respectable governance. She’s a political whore for sure!! Thank you for continuing to expose her malevolence. Sharing!! Thank you for this, Alfred. Very strong. This amoral dangerous woman should have been stopped long ago. What the hell has she got on Obama anyway?